john stadler - HOORAY FOR SNAIL! Back in 1982, Brian McConnachie, the founder of the humor magazine, American Bystander, wanted to use some of my work in his publication. I was putting the finishing touches on a piece when I was informed that the magazine had gone belly up. I was left with a very funny full-page panel and nowhere to use it. Out went the humans, in came the animals. It changed overnight from a geopolitical baseball satire to a funny baseball adventure for kids. That turned out well. As of 2018, HOORAY FOR SNAIL! is in its 34th continuous year in print. 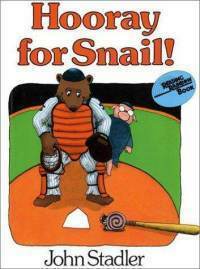 "Snail, the star of this short charming and utterly winsome little book about a baseball game, sits in the dugout... Somehow in the 32 handsome paintings and 29 simple sentences (not one of them more than five words long) that make up John Stadler's story, so much happens that it would insult this clever writer-illustrator to try and summarize it all..."
"How nice it would be if all beginners' books were so fresh and fine!" "The nicest kind of silly."